To Visit This Restaurant, Select the Button to the Left "Sign NDA." GREAT OPPORTUNITY FOR FAMILY RUN BUSINESS!!! This Restaurant is located in an Established Community in the Conejo Valley just off the 101 Freeway in a very nice Shopping Center. Serving this Community since 1979 with some of the Finest Italian Foods in the area, this business is a rare find. This is the go to place for Fresh Italian Subs or a Delicious Cheesy Pizza cooked just like Mamma did in the Old Country. Pair the great food with a bottle of Chianti or an Iced Cold Beer and Manga you are in Italian Heaven, especially finishing it off with a fresh cannelloni or tiramisu and a freshly brewed Cappuccino Italian Style. Guests can choose to dine on the Patio or the Dining Room. Both have the comfort of a cozy Italian Country Cafe feel. There is also a counter area where guests can walk up and order to go items. 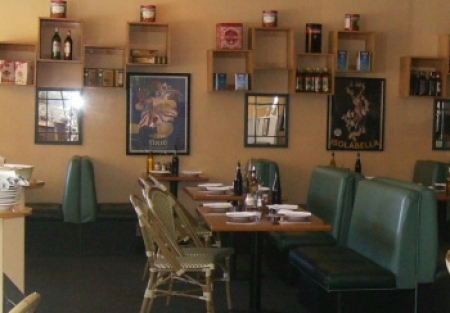 The deli also carries specialty Italian hard-to-find items, adding character to the business. The Catering and Take Out business is a good part of the business as well (approx 40%) with pans of their famous Lasagna, specialty Pastas with their homemade sauces being some of the favorites. Bowls of delicious Salads and desert trays are also available. The Owner is going to slow-down his life and smell the roses for a bit as he has been busy in the restaurant business since a youth and its time to pass the baton. Health issues have limited the owners involvement over the past few years and has contributed in the decision to sell the business. The lease has favorable terms for this area with a total monthly rent including CAM of $5,819 for the 2400 sq ft location and the 50 sq ft Patio area. The lease goes to Dec of 2019 and has 2 additional 5 year options so you are secure in this location. A Family stepping into this business could take advantage of expanding on deliveries, grow the pizza part of business as this is a high quality pizza and offering deliveries could be a nice jump in business and then expand on the catering to offer hosted events. Also get connected on Social Media and bring in the Millennials that are seeking out Great Food but seem to only be reached on Social Media rather than the old and tired coupons, print ads,ETC. Sales have remained strong over the years even with so many new restaurants coming into the area. Monthly sales have been averaging approximately $50.000. Sellers stated income has been in excess of $75,000++ per year and interested buyer will need to verify theses amounts as SellingRestaurants has not done so. The Kitchen is well equipped with all that is needed including a LARGE Dough Mixer, Double Pizza Oven, Burners, Grill, Fryer, ETC.